A few months ago I had the great pleasure of meeting Ashli Matus George at my sister’s bachelorette party. Ashli works with my sister, and over a little too much wine that night she shared with me stories about her brave and loving family. A little family history: December 2004 was an exciting time for Ashli’s family. Ashli was recently engaged, Ashli’s sister Kristin was expecting a new baby, her brother-in-law Mark was enjoying family time before deploying with the US Navy, and Christmas was coming. They were all there to celebrate the arrival of baby Allyson. 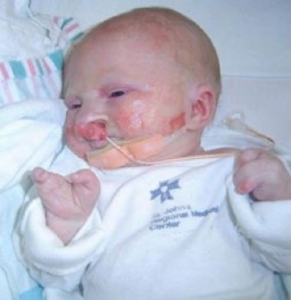 Upon her birth, Ally’s unknown syndrome surprised them all. You see, Ally was born with a bilateral cleft lip and palate and just two fingers on each hand and two toes on each foot. 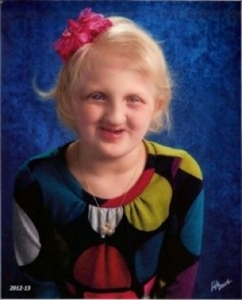 In the weeks that followed, they learned that Allyson had a rare genetic condition called Ectrodactyly-Ectodermal Dysplasia-Clefting Syndrome (EEC Syndrome). Ally at 8 weeks old. With the support of extended family and a ton of friends, this family sprung in to action. With so many questions and so few answers (the doctors were literally thumbing through medical guides), Ashli found the National Foundation for Ectodermal Dysplasias (NFED). The foundation immediately became invested in Ally and they became joined with other similar families. Together these amazing families gain strength to overcome adversity. Ashli shared with me that by age four, Ally became legally blind. She reads and writes in Braille, and is able to see details of objects up close. She is so comfortable in her familiar environments that sometimes everyone “forgets” that her vision is limited because of how independent she is. She has a spunky personality and a lot of determination. Ally performs with a local theater group, recently became a Junior Girl Scout, and loves to write. She has written at least six ‘short’ stories (with more than 10,000 words each!) There’s nothing that she thinks she cannot do! Ally at 8 years old. Kristin, Ashli, and the entire family have planned for Ally’s future and learned that navigating the complex legal and financial strategies can be overwhelming. Often families don’t know that they should find professionals who have special needs experience to guide them. I spoke with Ellen Linares, a financial advisor specializing in special needs families. She stressed the importance of including the extended family in the planning process and said, “Some families don’t realize they should not name a special needs family member as the beneficiary of any financial asset. Even a modest inheritance can make them ineligible for government benefits.” There are ways to mitigate this risk with a special needs trust, but that is just one piece of the puzzle. Ellen recommends A Special Needs Plan as a first place to start for families who want to plan for their special loved one’s future care and financial well-being. I was impressed by the free guidebook they offered called The Family Advocate. It covers the 7 most common misconceptions about special needs planning, the 10 most common mistakes to avoid, and 11 questions to ask when interviewing professionals. They also have DIY packages and can help you find advisors experienced in special needs planning. I look forward to watching Ally grow up and am confident I will continually be inspired by this amazing little girl and her loving family. I follow her story on Facebook and you should too! (Rally for Ally | Facebook) If you have a few more minutes today, I encourage you to read this blog post where Kristin shares the roller coaster ride of Ally’s birth and the day-to-day challenges of being a military family with a special needs child. 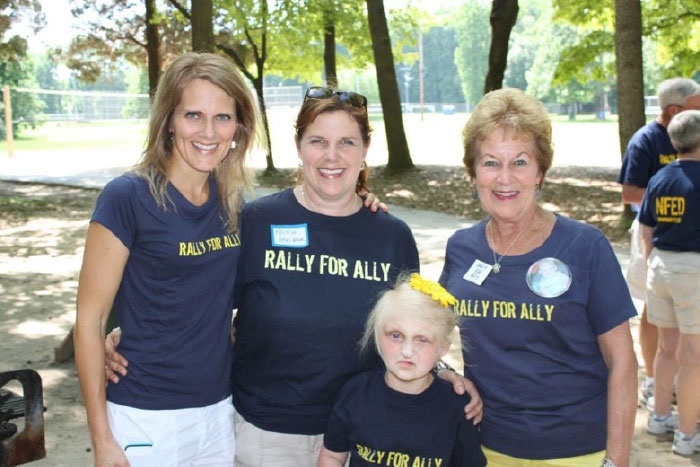 Because of Ally’s condition, Ashli founded Rally for Ally, an annual event to help raise funds and awareness for the National Foundation for Ectodermal Dysplasias (NFED). So far the Kelso-George-Matus family and friends have raised over $100,000 for the NFED. I was surprised to learn that the NFED is the only organization dedicated to serving the individuals affected by these syndromes. How can you help? If you are interested in donating: Please DONATE NOW and designate RALLY FOR ALLY in the note. I too want to do more, so 50% of all proceeds from each new Torch Pro account using the coupon code rally4ally will go to NFED in Ally’s honor.